Prince Fielder connects for the first of his homers on Sunday. Phil Coke did not approve. 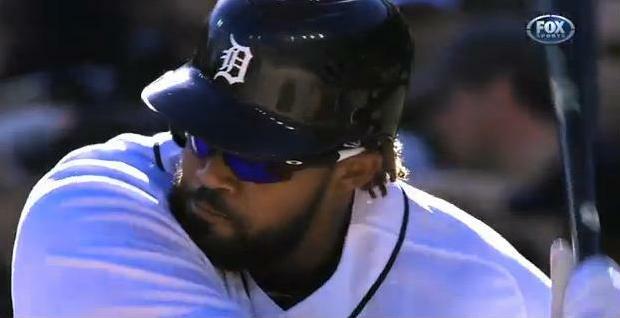 On Saturday, Prince Fielder launched two home runs off of Boston’s Josh Beckett within the game’s first five innings. In the bottom of the seventh, he was hit on the calf by Red Sox reliever Matt Albers. Phil Coke came out of the Detroit bullpen a half-inning later with the perfect opportunity to exact retribution: He faced Fielder’s first-base counterpart and fellow superstar, Adrian Gonzalez, with a 10-run lead. Instead of sending a message, however, he struck Gonzalez out. There may be great power in hindsight for Phil Coke, or he may have had the finer points of the “We’ve seen enough of this crap” method of pitching explained to him by teammates or coaches after the game. That would explain his appearance on Sunday, when, in the seventh inning, the left-hander made up for opportunities lost. With Dustin Pedroia on second and two outs in a game the Tigers trailed 9-7, Coke—a day late—went gunning for his man. His aim was as poor as his timing, however, as Coke’s pitch sailed up near Gonzalez’s head, without any real danger of hitting him. Which is where the umpiring at Comerica Park comes into question. It might have been a good idea. With his next offering—and two bases open, after Pedroia took third on the previous pitch—Coke hit Gonzalez in the back. Bobby Valentine raced out for a chat involving, among other things, disbelief that the pitcher had not yet been ejected. It didn’t have much effect; only after crew chief Dale Scott consulted with Iassogna were warnings even issued. Coke remained in the game. Iassogna has some history with this type of thing, having notably erred on the reactionary side earlier in his career, much to his own detriment. In 2002, before he had even reached full-time status with MLB, Iassogna was behind the plate for a game in which the Dodgers led the Reds 4-0 going into the ninth inning. After Los Angeles closer Eric Gagne gave up a bloop single and a two-run homer, he hit Adam Dunn with his next pitch. That was all Iassogna needed to see; he tossed Gagne on the spot. The details of this particular story matter, however. Gagne’s pitch to Dunn was clearly unintentional; it only grazed the bottom of the slugger’s jersey, failing even to hit flesh. When Gagne was ejected, Dogers manager Jim Tracy lost his mind. Gagne and Tracey were both ejected, the Reds tied the game with two more runs off three more pitchers, and Cincinnati won it in the 13th against Omar Daal, who had been scheduled to start for the Dodgers the following day. It’s enough to make an ump gun shy, which Iassogna might be these days. That certainly appeared to be the case on Sunday. “They should’ve given a warning after the one at (Gonzalez’s) head, the first pitch,” said Valentine in the Boston Herald. Gonzalez, too, worried about the lasting effects of the umpire’s decision. Next chance: May 28, in Boston. No word yet on the whereabouts of Dan Iassogna that week.